"Yummy, and easy to make." Preheat oven to 325 degrees F (165 degrees C). Grease a 2-quart baking dish. Bring the rice, water, and salt to a boil in a saucepan. Reduce heat to medium-low, cover, and simmer until the rice is tender and most of the liquid has been absorbed, 20 to 25 minutes. While the rice is cooking, cook the bacon in a large, deep skillet over medium-high heat until evenly browned, about 10 minutes. Reserve about 1 tablespoon of bacon drippings in the pan. Reduce heat to medium. Drain the bacon on a plate lined with paper towels; crumble the bacon once cooled enough to handle. Cook and stir the onions in the reserved bacon drippings until translucent, 5 to 8 minutes. Stir in the crumbled bacon, tomato sauce, tomato paste, sugar, Worcestershire sauce, and hot sauce; bring the mixture to a simmer, reduce heat, and simmer for 10 minutes. 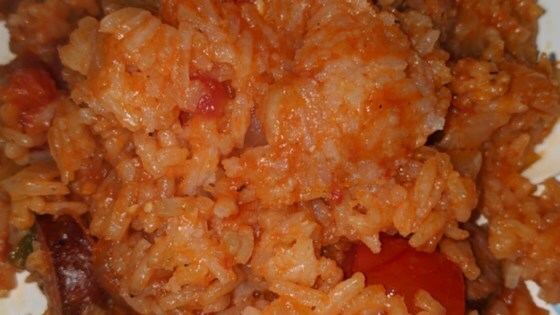 Spoon the cooked rice into the prepared baking dish and stir the tomato-bacon mixture into the rice until evenly combined. Cover the dish and bake in the preheated oven for 45 minutes. Its a good recipe but I like dishes with a bit more kick. I made it a second time with a dash of ground red pepper and a handful of shakes of extra hot hot sauce over the pan. Kicks it up nicely. Where I'm from (which is bout and hour south of Charleston), we have this dish for every family function. This is an excellent recipe! I add celery and cook it along with the onion because it is what my mother, a Charlestonian, always added.